A DNA barcode is a short sequence of mitochondrial DNA that can be used to identify species. The four letter code of the genetic language can be translated into colour for easy visual inspection. 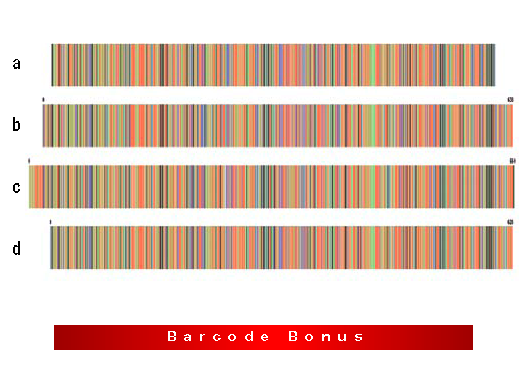 A colour DNA barcode then becomes 650 vertical stripes made out of four different colours. DNA barcodes have been used to identify species of almost all groups of animals, seaweeds and fungi. It works because the level of difference between different species is much larger than the amount of variation within species. DNA barcoding is useful in the study of pollinators for many reasons. First, with almost 20,000 described species, bees are often extremely difficult to identify using traditional external morphology and a microscope. 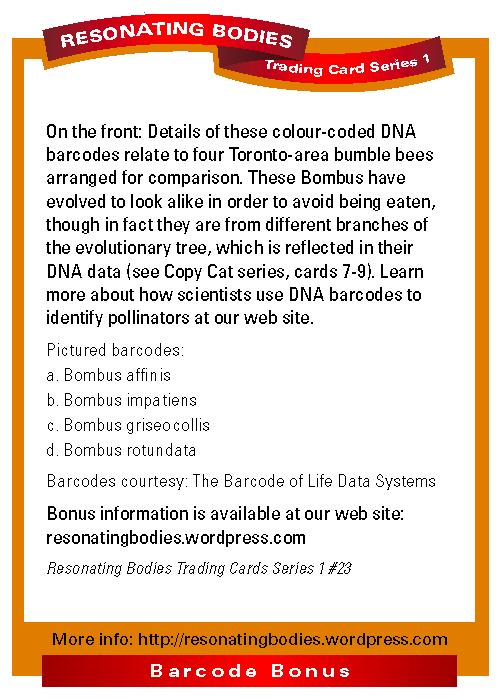 Card 23 of our tradings cards show the comparison of four bee DNA barcodes. Here are the barcodes of the bees that appear in Trading Card Series 1. At the resolution they appear on this page, the bars blur into one another to form more than four colours. Click on each barcode to see it more accurately. When viewing the full resolution barcodes you can save them to your desktop (right-click for menu) or print them out to compare. The DNA barcodes were supplied by The Barcode of Life Data Systems. The Barcode of Life Data Systems (BOLD) is an online workbench that aids collection, management, analysis, and use of DNA barcodes. Canadian Centre for DNA Barcoding Spear-headed by Paul Hebert, this worldwide DNA barcoding initiative is supported by the sequencing facilities at the Canadian Centre for DNA Barcoding. Bee-BOL is a campaign that aims to obtain DNA barcodes for the bees of the world. This web site should be of interest to bee biologists, pollination biologists, agricultural researchers, conservation biologists and anyone who enjoys their food.